Malaysia has approved RM61.6 billion in investments for foreign and domestic direct investments in the first eight months of the year, said Deputy International Trade and Industry Minister Dr Ong Kian Ming. The Malaysian government has expressed plans to narrow their YoY budget deficit from 3.7% to 3.4% next year. However, analysts at Fitch Solutions stated that their forecasts remain at 3.7% as they dread that the country’s continued dependence on oil revenues pose risks to the government’s fiscal consolidation plan. Malaysia’s central bank kept its key interest rate at 3.25 per cent on Thursday, as expected, while eyeing a slowdown in economic growth and planned public spending cuts by the new government. The maritime industry policies such as the Malaysia Shipping Masterplan needs to be updated with elements of Industry 4.0 to strengthen the industry’s contribution to the economy. Public Bank Bhd, which today launched the all-in-one digital payment terminals in partnership with Revenue Group Bhd, is the first bank to roll out such an integrated payment terminal in Malaysia. Malaysia has slapped provisional antidumping duties of 3.33% to 16.13% on galvanized iron imports from China and Vietnam, effective November 8 for about 120 days, the Ministry of International Trade and Industry said Thursday. Talks on Malaysia’s proposed East Coast Rail Link (ECRL) project are still on going with the Chinese counterpart and Malaysia needs a little bit more time to address the issue, says Council of Eminent Persons Chairman Tun Daim Zainuddin. The government has good intentions in introducing the property crowdfunding initiative, the first such financial innovation in the world, but proper studies need to be carried out, said the Council of Eminent Persons Chairman Tun Daim Zainuddin. Malaysia’s Budget 2019 indicates greater transparency in the country’s public accounts and a focus on inclusive growth, which if sustained, will be credit positive, says Moody’s Investors Service. CIMB Equities Research has upgraded Malaysia Airports Holdings Bhd (MAHB) to Add, with a slightly higher sum-of-parts based target price of RM9.80, as it believes the 8% share price sell-off on Monday was on unwarranted fears. Former Malaysian prime minister Najib Razak arrived at the Malaysian Anti-Corruption Commission (MACC) headquarters at 9.40am on Thursday (Nov 8) after being summoned again for questioning. The government’s strategies have led Malaysia to be among the least vulnerable to risk looming the emerging markets, economists said. Malaysia will face its third Universal Periodic Review (UPR) by the United Nations Human Rights Council (UNHRC) in Geneva, Switzerland tonight, even as the new Pakatan Harapan administration works to bolster the country’s human rights track record. Malaysia has many unique qualities and skill sets that puts it in an ideal position to adopt Industry 4.0, maybe even more so than its Asean neighbours, says Fusionex International vice-president of new technologies Raju Chellam. “Malaysia is waiting to be your profit center,” declared Prime Minister Mahathir Mohamad during his November 7 address to corporate figures and captains of industry at the Malaysia-Japan Economic Association forum in Tokyo. Moody’s Investors Service has affirmed Petroliam Nasional Bhd’s (Petronas) A1 domestic issuer and foreign currency senior unsecured ratings, but changed the outlook from stable to negative. Malaysian Pacific Industries Bhd (MPI) posted a strong 20.3% increase in net profit to RM63.25 million for the first financial quarter ended Sept 30, 2018 from RM52.59 million in the corresponding quarter last year mainly due to higher revenue. AirAsia will enhance connectivity from Kota Kinabalu with daily direct flights to Bandar Seri Begawan, Brunei Darussalam starting 18 January 2019. We Malaysians are a prideful lot when it comes to our food, not hesitating to get into verbal altercations with our neighbours over the origins of our favourite meals. Graft busters have questioned former Bank Negara Malaysia (BNM) governor Muhammad Ibrahim over the central bank’s controversial RM2 billion (S$659 million) land purchase from the Finance Ministry in January. A coalition representing over a hundred taxi drivers’ associations has threatened to continue protesting at the Ministry of Transport if its minister Loke Siew Fook fails to personally meet cabbies to hear their complaints. Hartalega Holdings Bhd recorded a higher net profit of RM120.2mil for the second quarter (Q2) ended Sept 30, 2018 from the RM113.7mil in the same period last year. Ranhill Holdings Bhd’s subsidiary SAJ Sdn Bhd and Indah Water Konsortium Sdn Bhd (IWK) have entered into an agreement to implement joint billing for water supply and sewerage services in Johor. Nextgreen Global Bhd, Nomura Holdings Inc and IHI Corp have entered into a memorandum of understanding (MoU) to explore collaboration and investment for a green technology park in Pahang spanning 410 acres. Malaysian and Indonesian officials say they have not heard from the de facto Kurdish government in northern Syria about its claims that it has a large number of Islamic State fighters from those Southeast Asian countries and their families in custody. South Korean water purifier manufacturer Coway has stepped up its game with the introduction of the first table top model with a large tank specially created for the Malaysian market. Former world number one Lee Chong Wei is planning to return to badminton after successful treatment for nose cancer and has set his sights on winning gold at the 2020 Tokyo Olympics, he said on Thursday. Malaysia is looking at introducing legislation similar to the UK’s Unexplained Wealth Order (UWO), The Malaysian Insight reported today, quoting Finance Minister Lim Guan Eng. Bangladesh’s coast guard rescued 33 Rohingya and detained six alleged human traffickers from a fishing trawler headed for Malaysia in the Bay of Bengal, an official said yesterday. 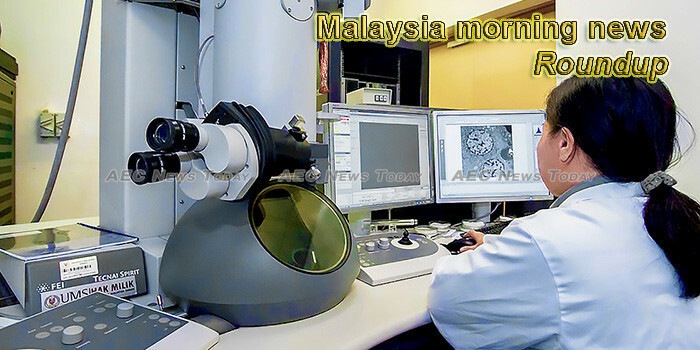 This week’s Malaysia morning news feature photo acknowledges World Science Day for Peace and Development, November 10.